Whenever I see a stale baguette on my counter, I think "bread pudding". This really is the BEST bread pudding I have ever made, and the easiest. I like to make bread puddings in loaf pans, because I like to slice them like cake, it makes it easier for serving. And if you line the loaf pan with parchment paper, you don't have to grease the pan, and you can just lift it out. Oh, I am just so helpful. Bread puddings are very forgiving, so if you don't have half & half, you can substitute whole milk. Butter a loaf pan or line w/ parchment paper. 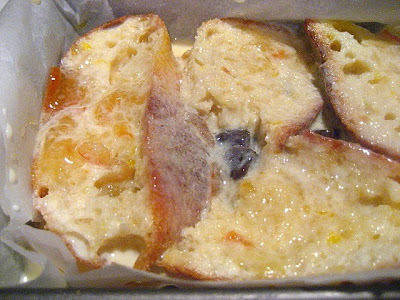 Tear your bread slices in half and spread orange marmalade on the pieces. 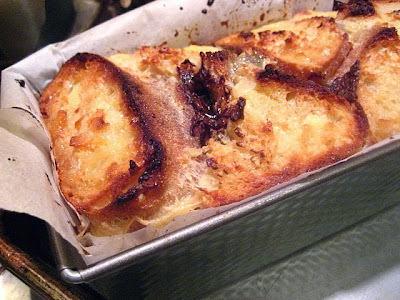 Lay one layer of bread on the bottom of the loaf pan, squeezing the bread in tightly next to the other slices to fit. Place some chocolate chips on top of the bread and create another layer of bread w/ marmalade and top with the rest of the chocolate chips. You should have 3 layers of bread total. 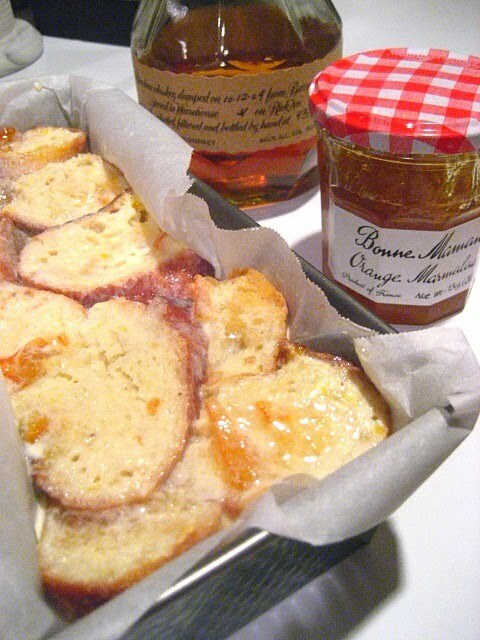 The top layer will only have marmalade on top. Whisk the eggs, cream, vanilla and bourbon until creamy. Pour over the bread slices and push down with your hands to make sure the bread is soaking up all the custard. Let sit on the counter 15 minutes to absorb the custard. Bake in a 350F oven for 45-50 minutes. 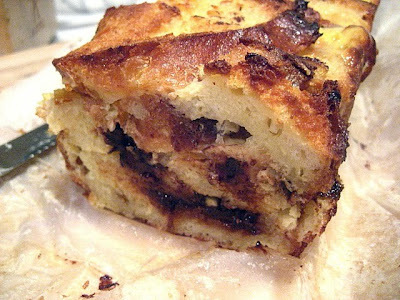 Bread pudding will puff up over the sides. Let cool completely in the pan, and remove to slice and serve. Delicious served warm, but also good at room temperature. When life gives you 2 feet of snow, make bread pudding! OMG!!!!!!!!!!!!! Two of my favorites together, chocolate and orange!!!! Looks delicious! My daughter Ashley just requested bread pudding yesterday. Thank you for the timely tips! I really like the use of a loaf pan with parchment paper. I usually just make bread crumbs from stale bread, but this is what I'll make next time. 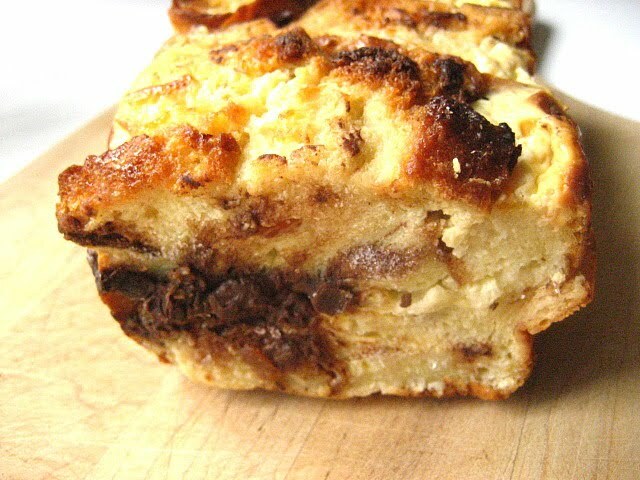 chocolate and bourbon in a bread pudding sounds irresistible. I almost never make bread pudding because I am a bit of a nazi about freezing leftover baguettes. But I could probably make a whole bread pudding with the odds and ends in my freezer. I LOVE the idea of putting it in a loaf pan - brilliant. Much fancier presentation! Thanks Stacey! Looks easy and delicious and chocolate and orange are my husbands favorites! Very cool snowy pic! We had some snow today here in Maple Ridge, B.C., but most of it has melted now! 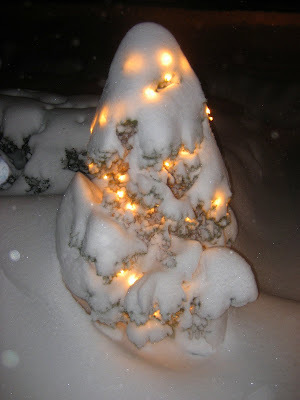 Hope You and your family had a Very Merry Christmas and I'm looking forward to more of Your wonderful recipes in 2011! Happy New Year!!!! I love chocolate and orange together!!! Oh wow, this could be very dangerous, very! Stacy, we made this bread pudding last night with good ol' Kentucky bourbon and a loaf of French bread. It was the B-E-S-T bread pudding we have ever tasted! We ate it warm out of the oven. Thank you for posting your delicous recipes, I look forward to your posts everyday. Happy New Year! Kara P.
It happened that I had a day old (or two) baguette on my counter yesterday when I was reading this post. So I made this, except with strawberry preserves. In the loaf pan with parchment too. Hands down, the best bread pudding ever! Thank you!